Talking Christmas Tree News: “Al Pine” To Sprout In Sackville? | Sack-Vegas!!!! Talking Christmas Tree News: “Al Pine” To Sprout In Sackville? 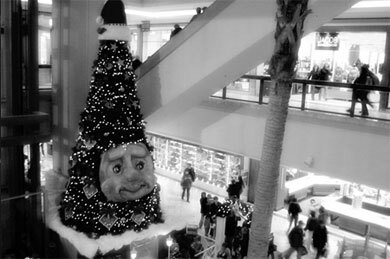 We all remember Woody the talking Christmas tree – right? I kinda miss the creepy old thing and I know my kids would have gotten a kick out of him. It looks like councillor Brad Johns is working on bringing a yakking tree back – to Sackville! His name *could* be “Al Pine” or whatever else the community comes up with. A contest with the school kids could be fun. -When I posted, I though Al Pine was a done deal. Woody, in Mic Mac Mall before he got “axed”. Posted by Sacky on July 15, 2014 in Shared News. A stupid, wasteful idea from a disconnected councilor desperate to appear relevant. Spending $25,000 for a Christmas display while we have crumbling infrastructure is a gross mismanagement of funds. How many potholes is that? We should have voted this fool out of office when we had the chance. Last time I looked there were people going without all around us. Divide the $25K by $25 and you have the ability to touch 1000 people/families in some fashion or another. Think that is too little ? Go with $50…still touching 500 people/families. Just some food for thought. Times have changed since Woody….they have become a lot tougher for people. This is not meant to be negative but realistic. Sometimes those that have are not privy to those that have not or don’t like to acknowledge it exists. I think this is great! Hope it happens! Let’s get behind this to bring people to Sackville. Let’s get on board to bring local families out to be proud of where they live. Potholes are everywhere, in every town and city. Deal with it. There are issues with infrustructure all around us. It is a balancing act between spending on ideas that will help the local economy and preserving exisitng resources. Hate to say it but roads do not generate money. Health care is extremely important but it is a drain on provincial funding. Dont get me wrong we need to have money for schools and health care but we also need to spend on ideas that will generate money for businesses. Is it a worthwhile cause? Sure, I’d go and spend $20 between pictures, some hot chocolate, gas, and a few coffees from Tims to get out of the house. I know at least a few hundred other families that would do the same.